← Bee Venom Destroys HIV! Imagine a world where HIV can’t replicate, then start believing! Posted on June 3, 2013 by Tom | Comments Off on Imagine a world where HIV can’t replicate, then start believing! The following article provides fascinating reading on the latest published research on the structure of the HIV virus itself. Be sure to watch the video and follow up on the references at the end of the article for more information. Excited? – We are! There’s no easy answer for HIV; the virus uses our own immune cells to its advantage and mutates readily to shrug off round after round of anti-retrovirals. But thanks to the efforts researchers from the University of Illinois and some heavy-duty number crunching from one of the world’s fastest petaflop supercomputers, we may be able to stop HIV right in its tracks. The latest line of attack against HIV targets its viral casing (or capsid). Capsids lie between the virus’s spherical outer coat, a .1 micron diameter, lipid-based layer known as the viral envelope, and a bullet-shaped inner coat known as the viral core that contains the strands of HIV RNA. 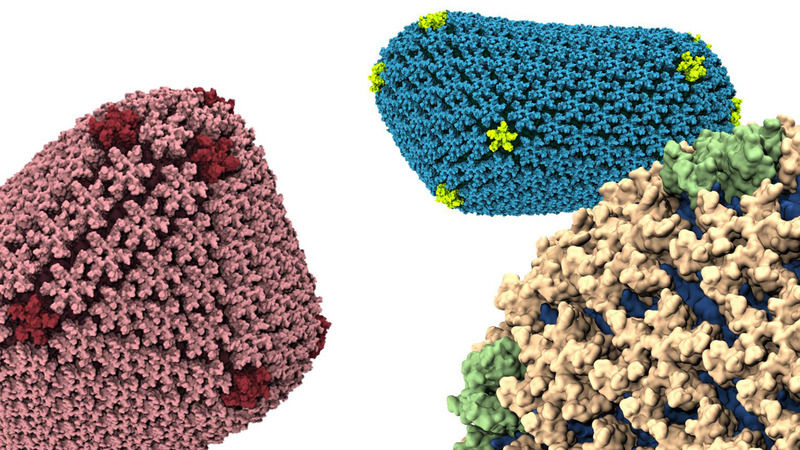 Capsids comprise 2,000 copies of the viral protein, p24, arranged in a lattice structure (a rough insight gleaned only from years of cryo-electron microscopy, nuclear magnetic resonance spectroscopy, cryo-EM tomography, and X-ray crystallography work). The capsid is responsible for protecting the RNA load, disabling the host’s immune system, and delivering the RNA into new cells. In other words: It’s the evil mastermind. The lattice protein structure allows the capsid to open and close like a Hoberman Sphere. The capsid is critically important for HIV replication, so knowing its structure in detail could lead us to new drugs that can treat or prevent the infection. The capsid has to remain intact to protect the HIV genome and get it into the human cell, but once inside, it has to come apart to release its content so that the virus can replicate. Developing drugs that cause capsid dysfunction by preventing its assembly or disassembly might stop the virus from reproducing. But until very recently, the precise structure—how the thousands of copies of p24 actually meshed together—remained a mystery. The capsid’s (relatively) large size, non-symmetric shape, protein structure has stumped researchers’ attempts to effectively model it. Earlier research had revealed that the p24 arranged itself in either a pentagon or hexagon shape as part of the capsid structure, but how many of each and how the pieces fit together remained out of reach because science simply didn’t have the computational prowess to model this incredibly complex subatomic structure in atomic-level detail. This problem required a petaflop-level supercomputer to solve, a class of machine that has only recently become readily available. The team turned to National Center for Supercomputing Applications at the University of Illinois at Urbana-Champaign and its resident supercomputer, Blue Waters. The team fed electron microscopy data collected in lab experiments conducted at the University of Pittsburgh and Vanderbilt University into Blue Waters and let the $108 million, 11.5 petaflop machine do its thing: Crunch massive amounts of information with its 49,000 AMD CPUs. Blue Waters can handle one quadrillion floating point operations every second, so stitching together 1,300 proteins into an oblong molecular soccer ball was no sweat. The team developed a novel shaping algorithm for the project, dubbed molecular dynamic flexible fitting. Said Professor Klaus Schulten of the University of Illinois in a press release. The mature human immunodeficiency virus-1 (HIV-1) capsid is best described by a ‘fullerene cone’ model, in which hexamers of the capsid protein are linked to form a hexagonal surface lattice that is closed by incorporating 12 capsid-protein pentamers. In all, the HIV capsid requires 216 protein hexagons and 12 protein pentagons to operate—arranged exactly as the predictive models said they would be. The new discovery reveals a stunningly versatile protein in p24. The protein itself is identical whether it’s shaped into a pentagon or a hexagon, only the attachment sites between p24 proteins varies between shapes. How that works remains a mystery. “How can a single type of protein form something as varied as this thing? The protein has to be inherently flexible,” said Schulten. New questions aside, this breakthrough illustrates precisely how the capsid works and how scientists can best attack that function to disrupt the virus’ ability to replicate. By exploiting the capsid’s structure, researchers theoretically could deliver a molecular padlock that prevents the viral core from opening and the virus from spreading. This discovery could lead to an entirely new suite of treatment alternatives and could finally outpace HIV’s ability to rapidly evolve resistance to current enzyme-based medications. Professor Simon Lovell, a structural biologist at the University of Manchester, said. It’s only a matter of time until HIV goes the way of polio. And it’s thanks in no small part to one beast of a computer. This entry was posted in Uncategorized and tagged blue water, Cryo-electron microscopy, cure, hiv, National Center for Supercomputing Applications, research, science, technology, University of Illinois, University of Illinois at Urbana–Champaign, University of Pittsburgh School of Medicine, Vanderbilt University. Bookmark the permalink.